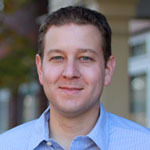 Tag Archives for " mobile marketing "
Today’s Guest Post is by Sam Balter – Enjoy! The customer journey is a simplified expression of the complex thought process of a customer looking to purchase something. A quick Google search for ‘customer journey’ brings up a myriad of complex diagrams full of hundreds of metrics. The truth is that every company has a unique customer journey; each marketing channel has a unique customer journey, and every product has a unique customer journey. All customers go through a different journey and engage with a brand in a unique way. The customer journey model relies on seeing a buying decision as linear and a one-off interaction. Brands that will succeed in cross-channel marketing are building a relationship with their customer in every stage of the journey. When thinking about mobile, specifically mobile messaging, it’s all about creating a frictionless and compelling experience for the customer. Let’s take the basic model of the customer journey: Awareness -> Consideration -> Purchase -> Retention -> Advocacy. The most successful businesses will foster a relationship each step of the customer journey, and along the way, delight their customer. Using a text call-to-action on outdoor signage helps get more from marketing dollars because the billboard creates an impression, and the mobile messaging gives you a way to speak directly to your customer. Mobile messaging adds a CRM component to an awareness campaign. To take this a step further, a brand might want to ask their customer for their zip code so that location-specific offers can be delivered. If you want to see some great CTAs, check out our site where we’ve compiled examples of successful CTAs, Art of the CTA. To optimize the efficacy of mobile as a channel, it’s imperative to send the right message at the right time. If Krusty Burger wants to increase lunch traffic, it makes no sense to send a message at 4:15pm. Instead, achieve optimal results by sending a message one to two hours before a customer is encouraged to take action. That way, when their stomach starts to growl, they know they’ve got a Krusty Burger coupon in their pocket. To take it to another level, consider using a share-with-friend function that will allow more people to get in on the savings while capturing more phone numbers in the process. This is an incredibly powerful step of the customer journey. I am very cheap, so sometimes purchasing things can make me feel a little guilty. It is important to offset these feelings of guilt with heart warming offers. For example, offer customers the ability to receive a receipt via Multimedia Message, thereby saving paper, or the chance to enter a sweepstakes, to win a prize. If you have connected unique coupon codes with your point of sale system, you can even deliver the customer a coupon just moments after their purchase. An excellent part of mobile messaging campaigns is that in the awareness stage, a customer can opt-in to a loyalty program, and from there, consistently receive coupons and deals. For mobile messaging loyalty programs, we suggest the offers vary; mix SMS and MMS, and collect different pieces of information every few messages. Ask questions like: What is your favorite meal? When is your birthday? What is your email address, etc.? Encourage customers to provide information with incentives, and only ask for information if you will use it to delight your customers. It seems like only a few years ago, the only way for people to advocate for a brand or product they believed in was through word of mouth. Now, every customer has access to a digital bullhorn. Capitalize on customers’ social media connects with mobile messaging by embedding ‘click to tweet or post’ within your message copy. At Waterfall, we are big fans of viral sharing campaigns. Dropbox built an enormous user base through a viral sharing campaign in which every referral you signed up added additional storage to your account. This is a great way to provide value to your most helpful customers by leveraging the power of social amplification. The customer journey has long reigned as a keystone of modern marketing. As we move into a cross-channel world, where brands are advertising to, providing content for, and engaging in conversations with customers, the journey will be replaced by a loop in which each interaction strengthens the bond between brand and brand advocate. 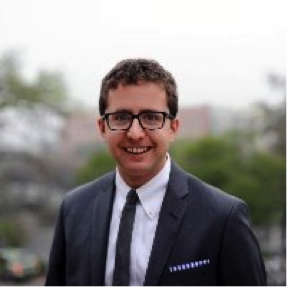 Sam Balter is a Marketing Manager at Waterfall, a mobile messaging and CRM provider that helps companies engage their customers on their phones. Sam writes about mobile strategy, industry trends, and how to create successful cross-channel marketing campaigns. It’s guest post day here at Duct Tape Marketing and today’s guest post is from Dave Landry – Enjoy! Mobile is becoming a powerful, driving engine in the content world. The January 2014 Mobile Technology Fact Sheet shows that 63% of adult cell phone owners use their phones to go online, while 34% of cell phone Internet users go online using only their phone rather than any other device. Mobile content is distinct because of the idiosyncratic and curious ways users interact with it. A Rumble study from 2013 found that while certain mobile app user behaviors were similar, most of those interacting with mobile content exhibited unique behavior. 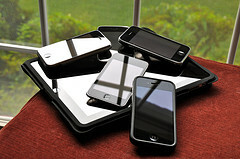 Apps account for 86% of the average US consumer’s time on a mobile device, while time spent on the mobile web declined. How can marketers make their content stand out in such a crowded mobile marketplace? You must optimize for the device as well as the way that users will interact with your site’s content. Mobile users NEED simple sites with easy navigation. Utilize the principles of responsive design to ensure that your content will display correctly for all users on all devices. You can amplify your reputation by being helpful and relevant to your audience. When you build trust, you also build a community – and this community will be vital when it comes to amplifying content. The cultivation of long-standing relationships is key to having your content amplified. Even if you’re not posting undeniably quotable and shareable content all day every day, your base community of followers with whom you regularly engage with will still have your back and interact. 3. Develop a mobile app. With so many users trading in time spent on the mobile web for time in apps, it’s easy to see why it’s beneficial to develop your own app to deliver content to users. The added bonus is that you can further target content for the segment of users that download and use your mobile app. Enable all possible sharing options to allow users to share content with their network. 4. Make mobile a part of your overall strategy. 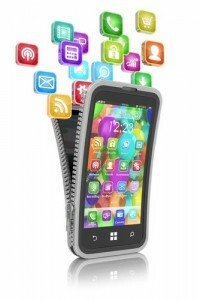 Keep your business and marketing goals in mind as you consider your mobile campaigns. Don’t make the mistake of treating mobile as something separate from your marketing strategy, as it should be integrated into the rest of your initiatives. Do not silo mobile because it will likely affect other aspects of your organization and marketing. Understanding where mobile falls into your overall strategy allows you to drive sales activities. In May 2014, Grabyo, a company specializing in real-time video, released a report stating that 72% of the traffic on their platform came from mobile. The company found that live TV clips generate exceptional levels of engagement on Facebook and Twitter. Content creators can sponsor these mobile clips to reach new members of their target audience. Content creators interested in amplifying content on mobile should consider paid sponsorship and advertising opportunities. With targeted advertising you will be able to measure exact analytics. 6. Don’t just think social – think branded. Mobile users are almost twice as likely to share content on social media sites. A study from the video technology company Unruly showed that branded Vines are four times more likely to be shared than branded videos. Brands like PepsiCo, AT&T, and General Electric are already taking advantage of consumers’ love for bite-size content and use it to boost their overall content marketing strategies. 7. Add SMS to the mix. comScore’s January 2014 report showed that 159.8 million people in the United States owned smartphones, making up only 66.8% of the mobile market penetration. The majority of devices on today’s market are SMS enabled. SMS messaging is affordable and provides a sizable ROI for marketers, as 90% of SMS text messages are read in the first 4-6 minutes of delivery. Perform a thorough analysis to help you understand what campaigns are working and which need to be adjusted. Take your newfound data and apply it to your next round of marketing. Your collected data and improved campaigns will be critical to amplifying future content. Successful content amplification is rooted in providing your audience with engaging, valuable content. With creative power and vision, marketers can take advantage of the wealth of opportunities that mobile opens up for them. 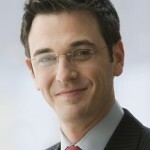 Dave Landry Jr. is a journalist and business owner who enjoy creating graphic and written content on his downtime. He hope you enjoy this article. It’s guest post day here at Duct Tape Marketing and today’s post comes from Adam Hope. In today’s increasingly mobile world, more and more marketers are focusing their activity primarily at mobile users. 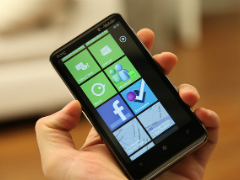 According to research from mobiThinking, there are over 2 billion people using a 3G or 4G mobile phone network. That means nearly 30% of the world’s population has access to high-speed mobile internet – and this percentage increases dramatically among business users and those living in developed nations. Data from eMarketer predicts that by 2017, 50% of the world’s mobile phone users will be using a smartphone with access to the internet and mobile apps. Mobile marketing is nothing new, businesses have been creating mobile friendly websites and using social media to reach their on-the-go audience for years. However, as with all technology, the industry is constantly evolving as new hardware and software are developed. These developments are aimed at enhancing the mobile experience for the user and are giving mobile marketers an increasing number of channels through which to reach their customers. One key area of growth in the mobile marketing world, is the use of targeted activities to connect with customers at events. Whether it’s creating a pre-event buzz, managing the duration of the event or keeping in touch afterwards, mobile technology offers countless possibilities for customer engagement. Event marketing is rarely a fixed location affair, with businesses travelling to meet their target customers’ locational convenience and, as such, mobile marketing and event marketing make a well suited pair. The event marketer’s job starts long before the actual date of the event and mobile marketing is a great channel through which to build pre-event hype. Social media and mobile friendly email campaigns are a fantastic way to reach your pre-existing audience, giving them an early introduction to an upcoming event. In order to have a wider mobile reach and grow your audience prior to the event, research influential local retweeters and sharers alongside complementary businesses in the location of your upcoming event. Get them to share your event information by building a relationship with these people and asking them to share information which may be of interest to their followers. There has been an emerging trend in the creation of custom event apps. Businesses are either creating an app specifically for an event or expanding their pre-existing mobile app to include the event. This offers the ultimate convenience to the customer – putting all of the essential event information in their fingertips. Apps also provide great brand exposure as your business’ branding is installed on the customer’s phone, keeping your message fresh in their mind, as they use their mobile device. Make it as easy as possible for your audience to access further information on your business, product or service at your event. Direct customers to your social media accounts by including information on how to find you online in your printed display materials. The use of QR codes has had a varying success rate, allowing mobile users to scan a code with their smartphones camera which takes them directly to your site. The more mobile channels through which your target audience can access further information, the better. The use of geotagging at events is extremely valuable to businesses as it shares your attendees’ location with their friends, having a visible knock-on effect on social media. Ensure your event’s social pages are set up in a way which allows attendees to ‘check-in’ to your location. The success of an event is generally measured by examining post-event data, whether it’s the number of leads generated or the level of attendee engagement. Social media is a great way to follow up your event and give attendees a specific #hashtag that they can use when sharing images or comments socially, during or after your event. This makes it easy for businesses to track any mentions and gather a general overview of the event’s success. Industry trends predict clear growth in the use of smartphones as people’s primary access to the internet. It is clear that successful event marketers will need to shift their focus to ensure that their events are fully integrated with mobile communications in order to ensure future success. Adam Hope is a blogger for The Events Structure – the UK’s largest single source provider of road show exhibition trailers and mobile event marketing vehicles. We provide versatile event venues for exhibitions, one off events and marketing roadshows. These range from inflatable pop-up structures to fully customizable exhibition trailers. We work with a variety of large and small businesses to promote their products at events around the UK. Our self-drive promotional vehicles offer the ideal economical solution for small businesses looking to make a big impact. 28	R U Collecting Mobile Phone Numbers Yet? A decade or so ago the cry was to build your email lists. It’s still a very valid tactic today, but now is the time to start collecting those mobile phone numbers too. About 60 billion people have mobile phones and with each passing year the technology improves to the point where it may be the only portal of information for some folks. First off, just like you wouldn’t spam with email, you certainly don’t want to grab mobile phone numbers from prospects and customers so you can send annoying messages. There are some great reasons to use text messaging however and smart marketers, including small businesses, are starting to discover them. Services like Mobile Storm and Mobivity are making easy and affordable for small business to explore the world of mobile marketing. Pizza joints are sending out coupons via mobile for sure, but small businesses of every ilk are also creating campaigns for weekly tips, event updates, contests and members only content via mobile campaigns. This is a very hot topic and one that’s not going away soon, so dive in and start learning. I conducted an interview with Kim Dushinski this week for upcoming episode of the Duct Tape Podcast. 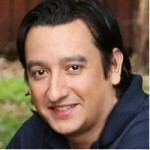 Kim is the author of the soon to be released – Mobile Marketing Handbook. I’ve had an early read and this is a great resource. More on that. When I go around the country to blog related conferences I find that the majority of bloggers I meet are Mac folks and iPhone nuts. With that in mind I give you the ultimate iPhone blogger trick. First, let’s create the icon. These icons, sort of like last year’s favicon, are called webclips. Now, grab your iPhone, fire up the Safari browser and surf to your blog. (It must be on the same domain as where you uploaded the image) Once there hit the bookmark + sign and select “add to home screen.” If all goes to plan your new image gets the rounded corner, glass button treatment and is now on your phone as an application icon. Call it iPhone vanity if you must, but it’s sure fun. You can take this a step further and use an application like mofuse to create mobile and even iPhone versions of your blog. 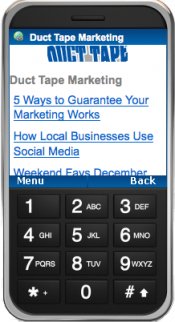 See example of the Duct Tape blog – Mobile version and iPhone version. If you want to add this blog right on your phone just surf to the iPhone version on your iPhone, bookmark and choose add to homescreen. Google announced a new mapping/mobile feature called My Location. My Location allow you turn your phone, using a browser and Google Maps, into a GPS device – even if it doesn’t have a GPS function. Not too many phones supported yet, including the iPhone, but this is another big leap for mobile advertising as, if you can just pull your phone out of your pocket and it knows where you are, it can deliver the nearby pizza ad without you doing much of anything. Of course directions, menu, specials and even a personal coupon could all be part of the deal. The remaining challenge is numbers. How do you get the numbers of users in general locations tied to the ads to make the financial model makes sense for service provider and advertiser alike. The service uses cell tower signals to approximate your location if you don’t have a GPS enabled phone.